EN IEC 60404-13 ed. 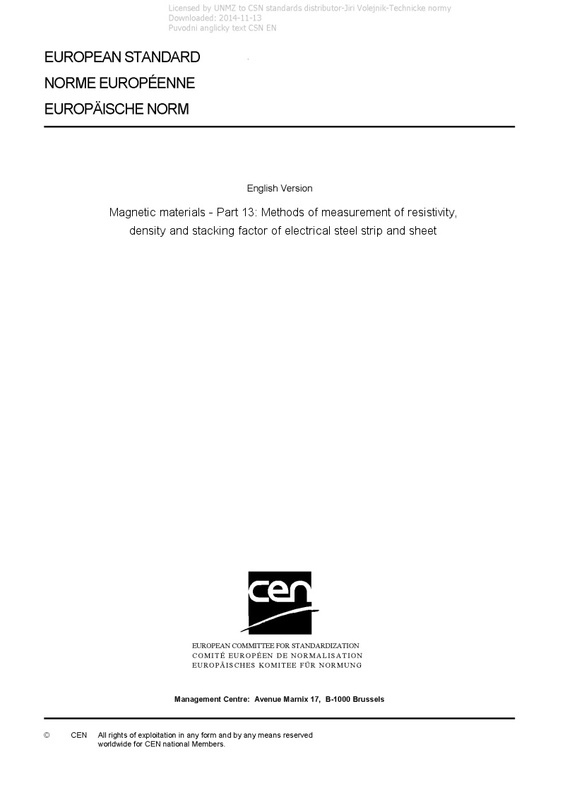 2 Magnetic materials - Part 13: Methods of measurement of resistivity, density and stacking factor of electrical steel strip and sheet - IEC 60404-13:2018 specifies the methods used for determining the resistivity, density and stacking factor of grain-oriented and non-oriented electrical steel strip and sheet. These quantities are necessary to establish the physical characteristics of the material. Moreover, the density is necessary to allow specified values of the magnetic polarization, resistivity and stacking factor to be determined. Since these properties are functions of temperature, the measurements will be made at an ambient temperature of (23 ±5) °C except when specified in this document. This edition includes the following significant technical changes with respect to the previous edition: the sequence of the density and resistivity sections is changed and the title of the document revised to reflect this; the van-der-Pauw method (Method R2) is also applicable to Epstein strip specimens; the gas pyknometer method is introduced, and the liquid immersion method and the calculation method based on the chemical composition are quoted; the requirements of the stacking factor section, such as the tolerance of the dimensions of the test specimen and the repeatability of measurement, are changed; an example of the apparatus for determination of the resistivity using a rectangular sheet, which was previously part of the main body of the text, is moved to constitute informative Annex A; an example of the determination of the density by using the gas pyknometer method is added as an informative Annex B; an example of the determination of density based on the calculation of silicon and aluminium contents is added as an informative Annex C.